For most folks, the onslaught of cold weather means an immediate retreat to the safety of the great indoors. But the cold doesn't scare you off, mostly in part because you finally have the opportunity to wear the Black Diamond Men's Stance Belay Synthetic Down Pant as you stand on belay. With PrimaLoft Silver insulating your buns, you're able to belay your buddy in total warmth, even if the pant gets wet. A Pertex shell encapsulates this furnace-like warmth with surprising durability considering how lightweight this pant is. Not to mention, Black Diamond coated the shell with DWR to ensure you stay some semblance of dry as you climb up those icy walls. 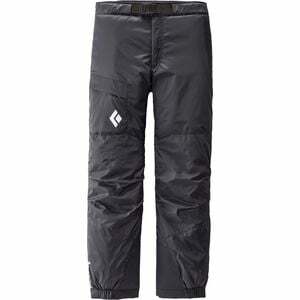 Additionally, the Stance features full-length side zippers that help you take off and put on this pant even while wearing crampons as well as helping with ventilation.